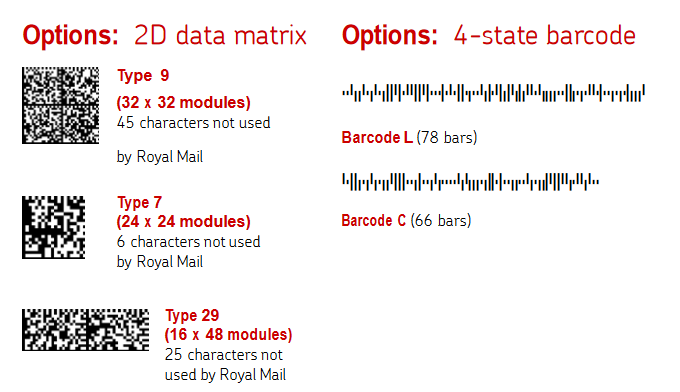 Royal Mail Mailmark™ barcodes was developed for machine readable Business Mail in Letter and Large Letter formats. Mailmark is replacing the Customer Barcode or CBC January 2018. The Mailmark barcodes include additional information that the CBC and Delivery Point Suffixes (DPS) was not able to include, such as tracking mail and delivery status, predictions of when mail will be delivered for marketing and advertising purposes and reporting statistics with data analysis. Mailmark™ barcodes are either 4-State or 2 Dimensional (2D) Complex Mail Data Mark (CMDM) barcodes. The amount of data needed to be encoded in the barcode will dictate which version needed to be used. You must be registered to receive barcode savings: www.royalmail.com/barcodesavings. Large Letters, including polywrap letters. The encodation scheme required for MailMark is C40, character subset 0, which is the basic set that encoders only upper case characters, numbers and the space character. characters) The PC and DP must comply with a valid PAF format (see appendix A). If there was no DP and a Unit is present then a default 9Z DP shall be used. If no Unit information is available the Sector Unit and Delivery Point fields will not be included. e.g. There are two types of 4 State barcodes on printed postage 1st class and 2nd class with English and Bilingual Welsh / English options. Barcode L, which is a Long barcode for domestic sorted and unsorted customers. Barcode C, which is a domestic sorted Consolidator customer. Format 1 Identifies the format of the item. Supply Chain ID 2 or 6 Identifies the unique chain of customers involved in the mailing. Consolidator Supply Chain ID are 2 digits. For more information: Mailmark Technical Handbook.